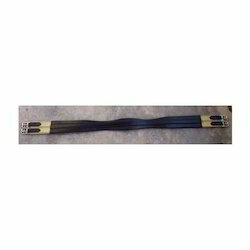 Leading Manufacturer of chafeless leather girth, panel leather girth and jump belly leather girth from Kanpur. Keeping in mind the diverse requirements of our esteemed clients, we are offering an excellent range of Chafeless Leather Girth. These girths are designed by using quality assured leather, these girths ensure comfort to the horses & riders on a ride. Our entire range is designed using high-grade fabric and sophisticated technology in order to meet the needs of our clients. In addition to this, our leather girth is quality checked under the supervision of our quality controllers to ensure its flawlessness. We take pleasure to introduce ourselves as one of the renowned manufacturer, exporter and supplier of exclusively designed Panel Leather Girth. Our offered product is . available in different sizes, all these girths are designed in compliance with the prevailing trends of the market. The offered product have become the first choice of the clients. Moreover, the range of Leather Girths is delivered from our end in excellent quality of packing. We present a splendid range of Jump Belly Leather Girth. Our state-of-the-art manufacturing unit strive hard to design this leather girth that appropriately leather girth the demand of clients and are up to date with the current trend. The offered leather girth is made available in diverse vivacious colours and designs. Apart from this, our clients can avail this range at industry leading prices..